InfoClick is designed to be used with Apple's Mail application to navigate through your emails to see the words, contacts, and information within. InfoClick knows precisely what words you've used, so there's no guessing; it offers a guided process of progressively narrowing down the matches in a series of simple choices. 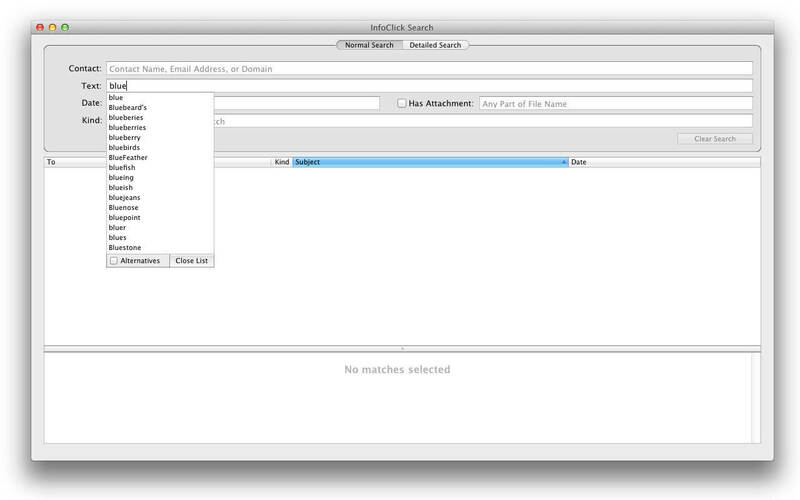 That means you can't ever produce a search with zero matches. For example, when you're searching for all emails containing a particular word, InfoClick would show the completions "connection", "connexion", and (the misspelled) "connecsion", if you'd actually used those words in your emails. 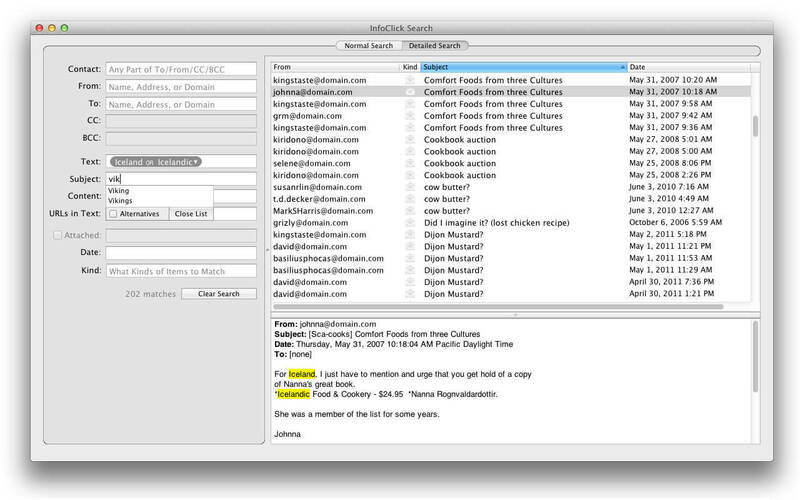 InfoClick offers additional features to make searching your emails easier. To see all emails received from educational organizations in the US, simply type .edu in the From field. 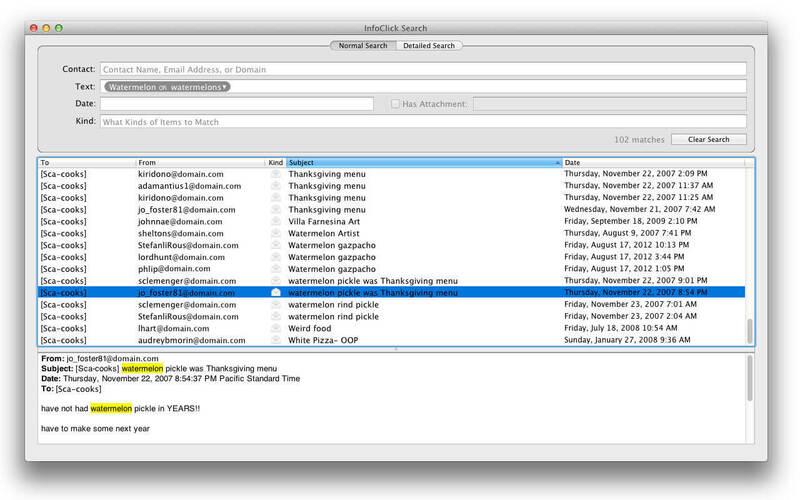 With a single click, you can narrow-down your search to only those emails that had an attachment, and/or those received in a given date range, and/or those that contain specific words. You can choose, as alternatives, all displayed word spellings used in the emails, so you don't miss an email because of spelling errors. Fixed: Apple Mail account names incorrectly show as gibberish (hex identifiers) on macOS 10.12 and later. Fixed: automatic launch of InfoClick at login did not work on macOS 10.12 and later. Added: InfoClick can print emails. Fixed: if InfoClick is denied access to an email folder, the user should be prompted to grant access. Fixed: possible crash when parsing spam emails with a particular kind of badly-formed HTML. Changed: reduced the number of alerts shown the first time InfoClick is used. Fixed: exporting emails as plain text should default to Unicode (UTF-8) text encoding. Changed: requires macOS 10.10 Yosemite or later.